Join us Saturday, October 19, 2019 and help support The U'ilani Fund and complementary care for those with breast cancer. Take advantage of early bird pricing and register for only $75 umtil June 30! Due to city and county permitting requirements, ride participation is limited to 100 riders. Don't be left out! You'll enjoy a beautiful ride along the Santa Cruz coastline followed by a celebratory Luau at the Seymour Center at Long Marine Lab overlooking the Pacific Ocean! The 50 and 25 mile routes take you through Santa Cruz along West Cliff Drive to points south including Capitola, SeaCliff State Park and Manresa State Beach. The Luau features fabulous Hawaiian food and entertainment and a chance to hear more about the work of the U'ilani Fund and complementary care for those with breast cancer. There are also massages available for riders. Please consider joining us in fund raising for the U'ilani Fund. The U'ilani Fund (pronounced oo-ee-la-nee) is a non-profit organization that provides funding to individuals with breast cancer to use for complementary care in order to improve quality of life. We support individuals in Santa Cruz, the San Francisco Bay Area, and Hawaii. To date we have provided support to over 1000 recipients, totaling $500,000. New this year : awards to the top 3 fund raisers! We hope you will consider creating your own fund raising page and help suppot a great cause. And, to see how all our fund raisers are doing. Need to rent a bike or a place to stay in Santa Cruz? Support our event in an Ohana T-shirt. Men and Women's Sizes Available. 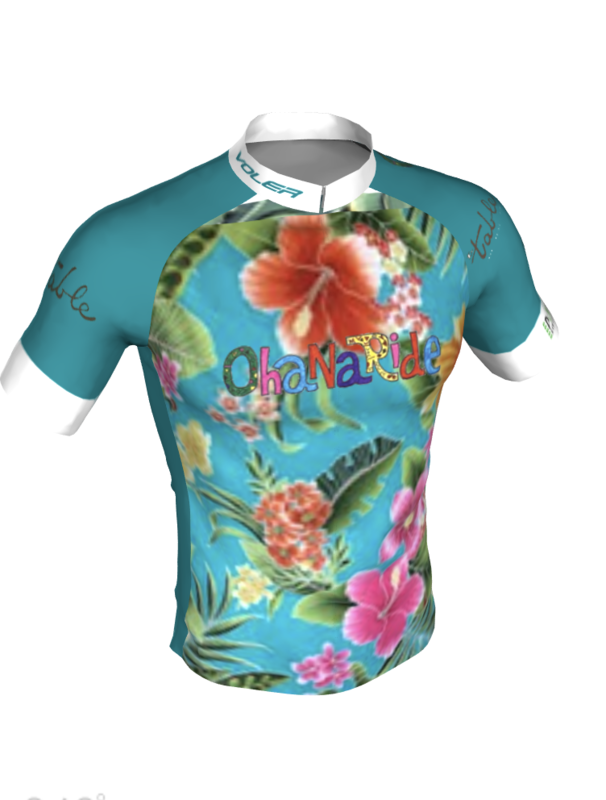 Join us in your festive Ohana Event Cycling Jersey from Voler Click Here to Order Your Beautiful Ohana Jersey! Men and Women's cuts and sizes are available. Order by Sept 1, 2018 to receive your jersey in time for the event. Free Shipping and Free Returns within 90 days!